Your spectator is handed a single Business card and a pen. They draw any image on the card and seal it into an envelope. They keep hold of the envelope at all times. You now start to read their mind and duplicate the drawing! Points to note. They do not lean on anything while drawing & at no point do you look at the face of the card. Yet you can still duplicate the drawing with frightening accuracy! Designed to be suitable for close up & walkabout situations as well as stage,parlour or Pre Show performances. It has taken Paul Nardini over 2 years of research and prototyping to create the Ghost Pad & it's truly a thing of beauty. Each Ghost Pad is crafted to Paul Nardini's exact specifications by Alakazam Magic & Tony Curtis resulting in one of the finest, most ingenious drawing duplication systems ever. The Ghost Pad uses a method that is as ingenious as the effect itself! 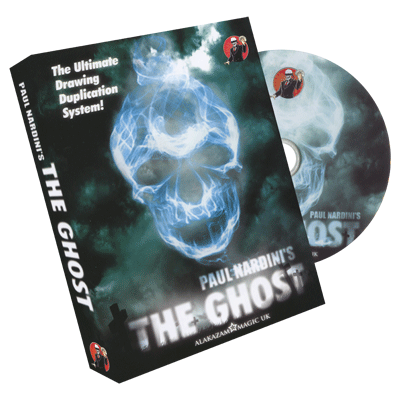 Each Ghost Pad kit comes complete with everything you need to start performing the moment you have watched the instructional DVD, Including access to the restricted Ghost owners FaceBook group, where you can share ideas & routines with other Ghost Pad users!. "Some pads in mentalist, are clever, practical, and some even raise the bar, Ghost has not only done all of it, it has exceeded my expectations. The BEST pad ever made, you may think you know, but you have no clue... believe the hype, TRUST ME on this." "The Ghost is the final answer in peek devices. It f*^#ed my brain, should be illegal." "WOW...I am speechless!! A VERY devilish method, absolutely clean and COMPLETELY different from any Imp. pad out there! I was really shocked to see the method at work...Genius!"